When you’re older and building your dream house, you are able to incorporate all the points of beauty and reflection that were a part of your journey to the new house. An adventurous couple was looking to move to Bend. 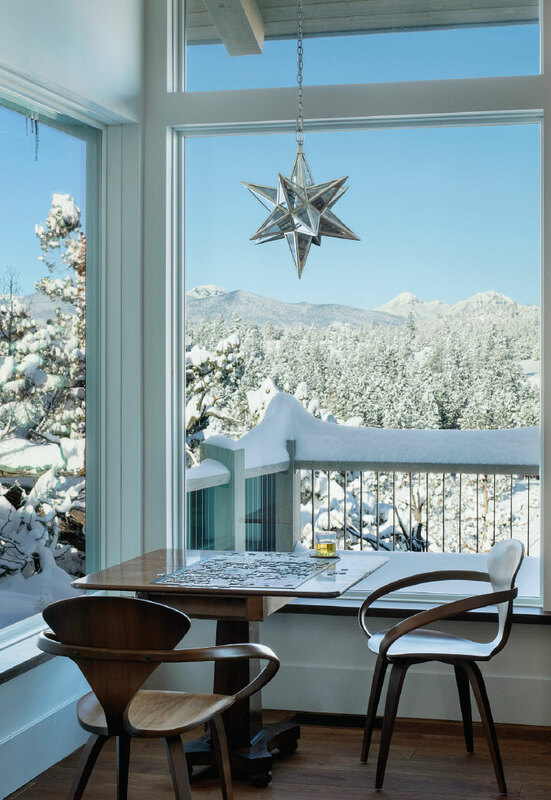 Excited to join their children and grandchildren and enjoy the Central Oregon lifestyle, they began their search for the perfect home, which was more about curating how to live in Bend’s 300 days of sunshine than just finding a second home. The homeowners are savvy New Yorkers who are true to their roots. He collects first editions of books that were adapted for screenplays, and she is currently needlepointing a 1996 Mt. Bachelor trail map for her son—commemorating his first winter in town. As collectors, craftsmen, and travelers, their eye for the horizon was met with a beautiful panorama on their lot in the North Rim subdivision. North Rim is a gated community that enjoys the topography of Awbrey Butte and sits about 900 feet above downtown Bend. This neighborhood in particular makes for a unique building experience. Integrating responsible development into design, the community is dedicated to xeriscape landscaping and open natural space. The houses melt back into the hillside, prioritizing views of Mt. Bachelor, Broken Top, Three Sisters, Mt. Washington, Black Butte, and Mt. Jefferson. 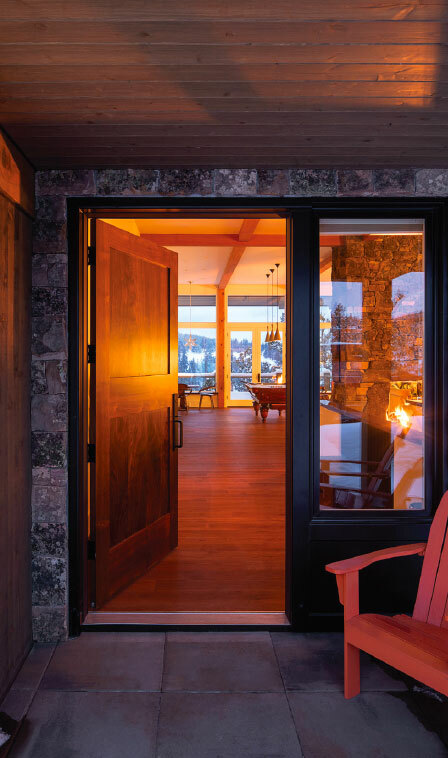 Nate Connolly of Ridgeline Custom Homes and Jeannie Legum of Legum Design began working with the couple soon after they took an interest. “Working with the North Rim HOA was great. Our vision for the project largely matched the vision for the neighborhood, which was one of the larger reasons we chose North Rim,” explains Connolly. It was an opportunity to build a house that honored where the clients had come from, where they were, and where they were heading. The house took into account design, material, authenticity, games, cooking, and at the center of it all, love. When you’re older and building your dream house, you are able to incorporate all the points of beauty and reflection that were a part of your journey to the new house. For these New Yorkers, that included contemporary apartments, old stone cottages, Connecticut farmhouses, Old World style, and an appreciation for a curated aesthetic. Legum understands that wide ranging diorama of interests and taste. ”For me, it is one of inquiry and exploration, and one of the most important pieces of advice I’ve ever received came from the amazing Art Gensler, of Gensler Design. He reminded me that my job above all is to be an investigator…Interior design is a very personal, even intimate, endeavor that requires trust, communication, and a shared vision. We work closely with our clients to truly understand their lifestyle, goals, and budget. I ask questions, listen to feedback, and serve as a guide throughout the process,” says Legum. Both Legum and Connolly were charged with crafting a living space that matched the clients’ needs. So Connolly designed and built their 5-bedroom, 3½ -bathroom, 5,000-square-foot custom home. 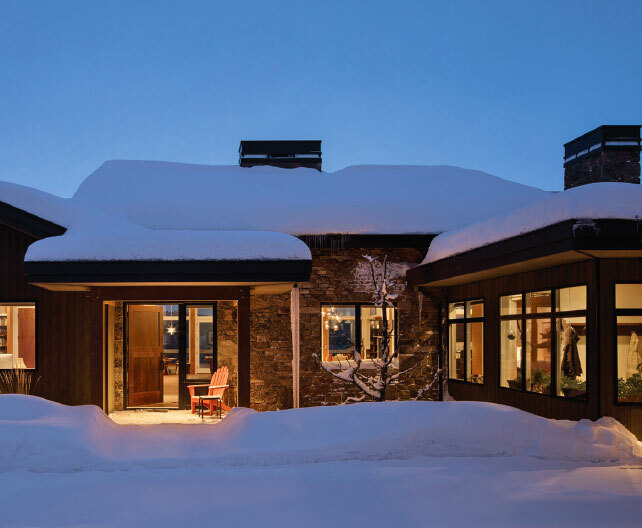 “We were charged with integrating ancient stone textures and modernist lines so we developed a fictitious story for the “past life” of the home to guide our architecture. 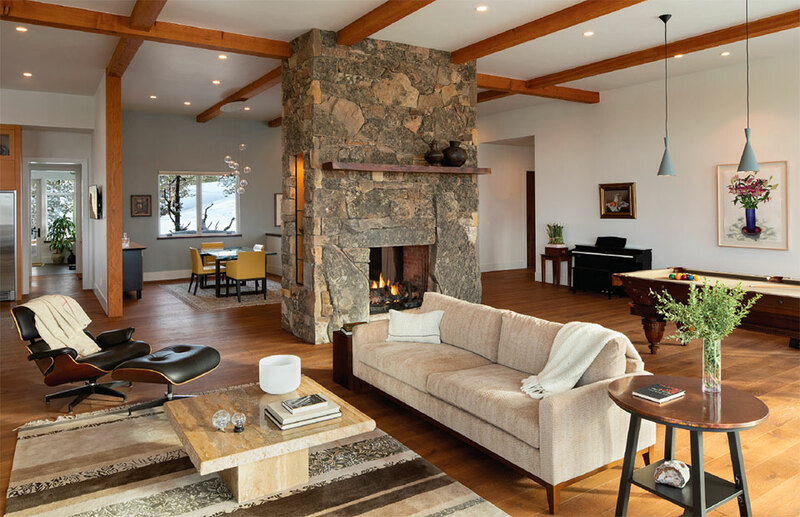 According to our story, the property started as an old stone farmhouse and barn, then “many generations later,” underwent a major contemporary renovation. Every decision from that point on was made to further that story. The client wanted any structure that was exposed to be functional not ornate. 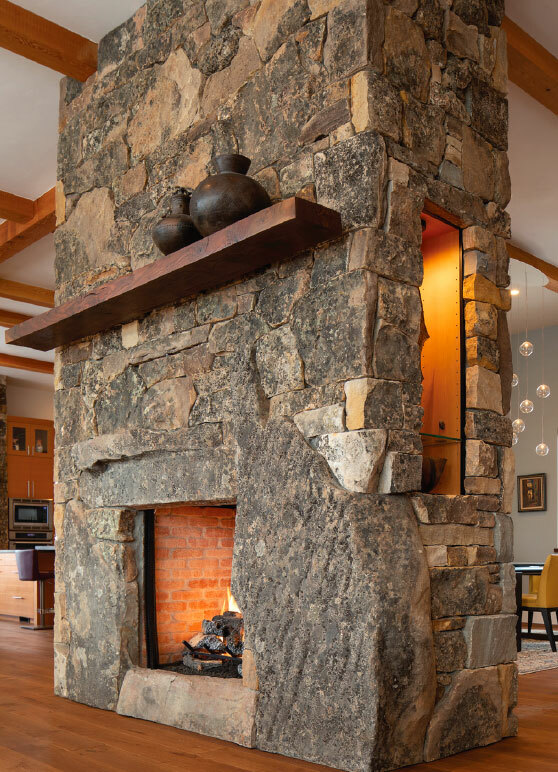 Montana Mossy stone veneer is held up by traditional fir timber framing, complete with mortise and tenon hand-cut joinery.” (The joints are important, so hold that thought.) And the building itself is trying to play its part as an eco-structure. “We paid close attention to the building envelope, used spray foam insulation, extremely high-efficiency mechanicals, and a solar array as a multiplier. Our goal was to build a structure that needed very little energy to maintain, and very efficient equipment to do it,” explains Connolly. Back to the joints. You need a peg to close a mortise and tenon joint. Connolly initially gave the couple 50 pegs to send out to their friends and families for well wishes to be written on before they were set into the frame of the house. “They needed 30 more, and we got buckets of pegs with notes and sentiments. The deck off the master is filled with pegs from family. Friends, coworkers, and people connected to the project are in the roof assemblies over the entryway, kitchen, and patio. And the smartasses are over the garage,” jokes Connolly. The New Hampshire-made hickory pegs are 1” in diameter and 12” long. ”This fireplace was the center of the design for this room,” according to Connolly. Everything grew from that central point and it’s meant to be the anchor for the entire house. The layout creates a focus on the air and earth qualities of the house with the wall of glass on the other side of the living room pulling in the mountains. 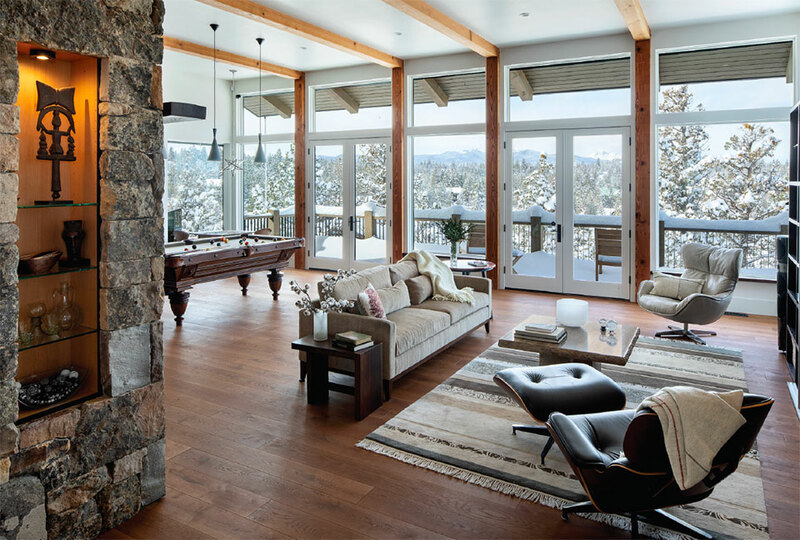 The view is grounded by the massive fireplace. “We used an Isokern firebox as the core, then used traditional Masonry block and stone for the rest. Cutting the boulders and moving them in place was a task. A team of stone and concrete cutters were used to carve inside corners out of the biggest pieces and the proven Egyptian techniques of leverage and inclined planes still work for putting them in place,” describes Connolly. 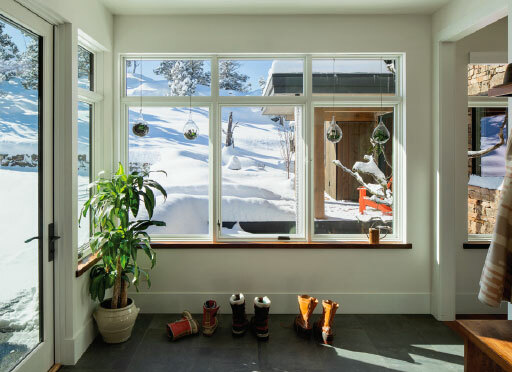 Communicating with a homeowner that’s not here year-round can be challenging but Connolly and Legum both have a mindful approach of how to work off-site when the site is 3,000 miles away from the client. Legum explains her process and explains, “We use all types of technology, starting with images online but also from magazines for inspiration to help establish the vision. Then we work thru CAD, Sketchup, and InDesign for our elevations and detailing, always circling back to the tactile feel with our mood trays.” Her holistic approach has found elegant and simple solutions to meeting the vision a client is trying to achieve. Connolly is just as organic and flexible about his process. Custom homes are an intimate process from design to material to construction; things happen and people happen. So whether battling weather or deliveries, Connolly sets his barometer at the speed of his client. “My only rule of thumb as to how often to meet with clients is that it is the right amount. Every client has a different level of involvement and interest in a project that makes them feel comfortable and connected to the process. We build custom homes, and each one gets a custom process,” he shares. The subtle but welcoming and expansive open floor plan of the house gains even more warmth from the texture and hues used to complete the space. The Claro Walnut is native and only grows in the Pacific Northwest. 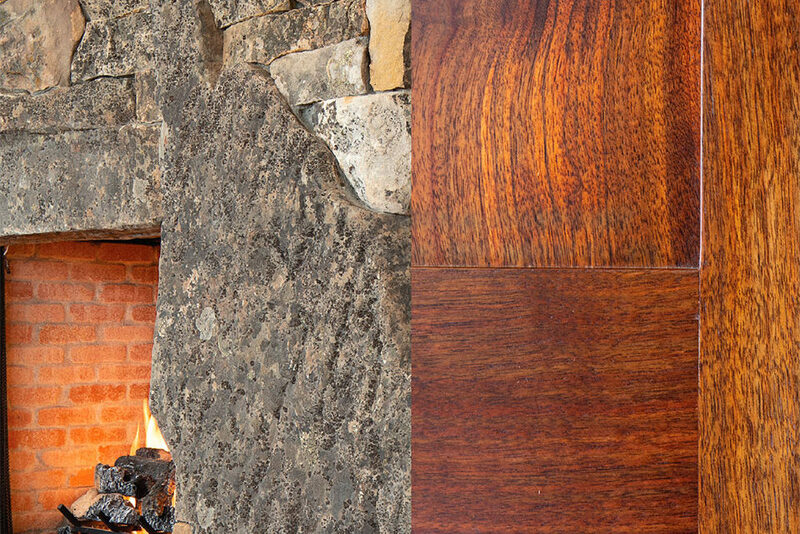 Deep rich brown with purple hues, Claro Walnut is a temperate-zone hardwood and an iconic texture representing the Oregon climate. 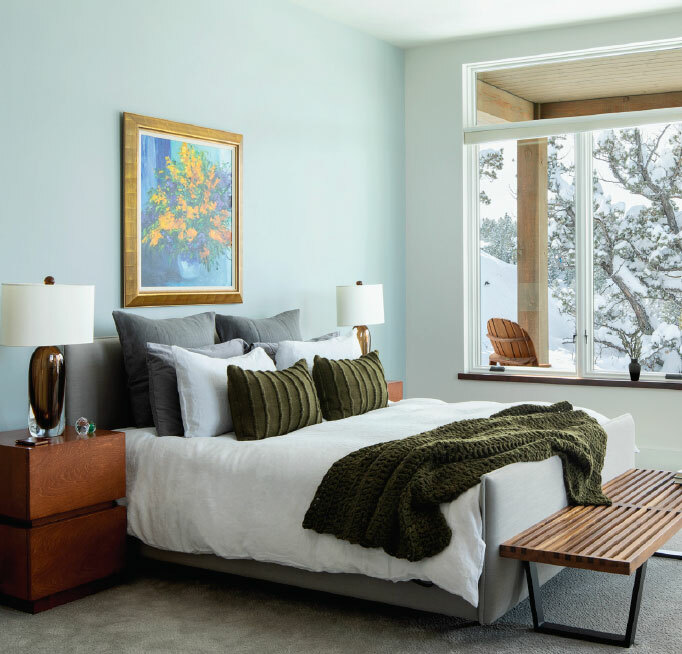 “We didn’t want the home to feel cavernous and cold,” explains Legum. “We didn’t want the house to be austere. 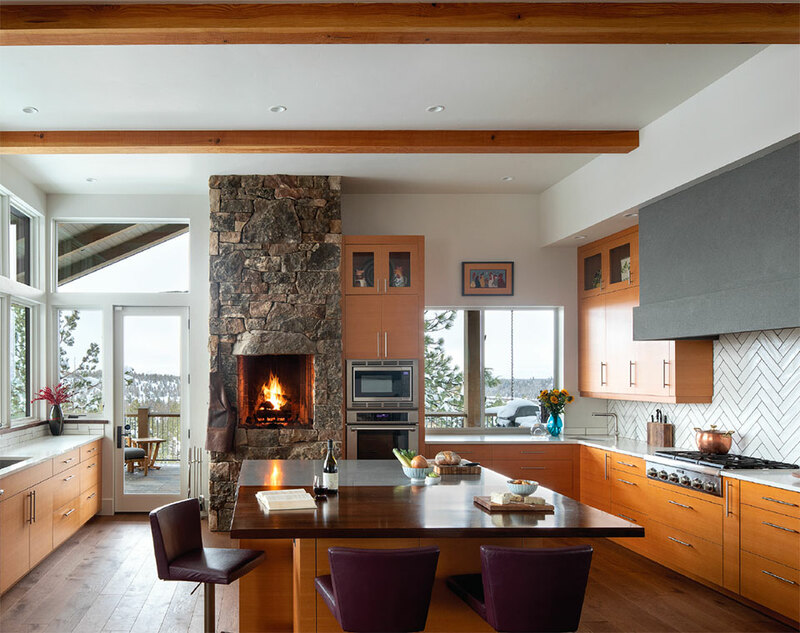 We needed the warmth of the wood tones to come through and work with the natural stones on the fireplace and the VG fir cabinets.” The foundation result is an impressive homage to Oregon. The Claro Walnut with its open grain and red tones coupled together with the VG fir cabinets and the custom stained European white oak floors gives you the sensation that you are standing in a tree house. This tree house though, sits just above the Deschutes River Canyon and its Rock Bluffs. And as the crow flies, and socializes, it’s a pretty good roost for entertaining and playing a round of pool on a custom table. The small details and materials are not lost on each other with Legum’s and Connolly’s collaborative approach. 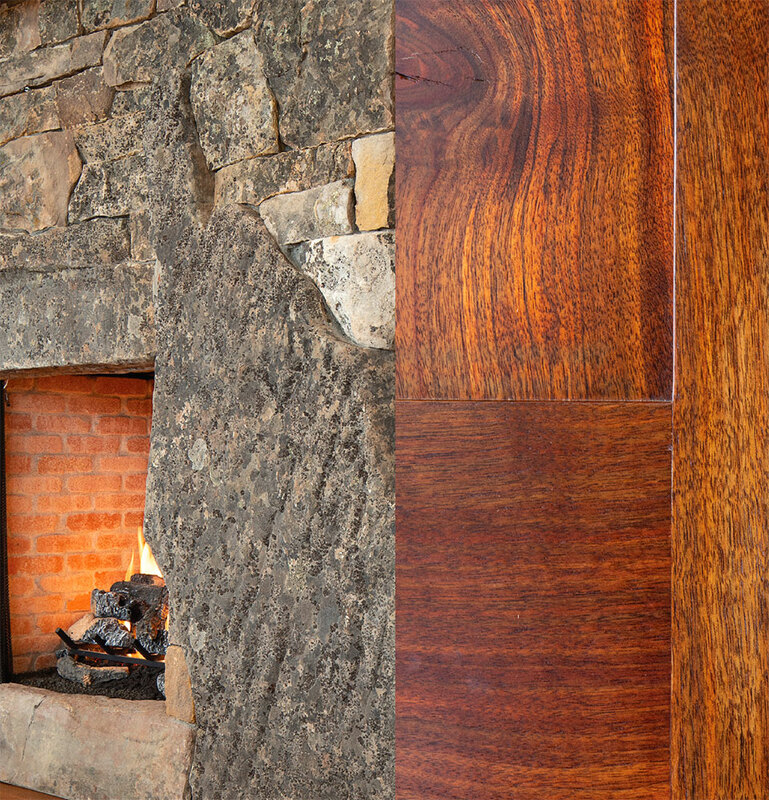 The Claro Walnut entry door was custom built by Connolly. Weighing in at over 200 pounds, the door is as subtle as it is grandiose. “You can walk through it once and not think about it but the fourth or fifth time, you can’t help but be taken in by the grain,” he says. Going into the project, Connolly and Legum knew their clients wanted a single-floor layout for the main residence and independent guest quarters. The function was two-pronged. Their family members and guests can enjoy an independent residence for vacations. And one day when it’s necessary, the couple can have the caretaker’s quarters required for their later years. “In the last ten years, most of the houses I have built have been for families,” says Connolly. According to him, many people come out to visit their children and then their visits become part-time and eventually full-time. “One thing that has become part of the design discussion is the home office and how to make working remotely a reality. My job is to make the modern home/work balance possible,” says Connolly. As Connolly discovers the flow in his clients’ lifestyles, Legum finds the sacred, celebrating the space with areas for treasures and collector’s pieces. That includes the kitchen. The clients are clearly doers: they play games, they craft, they collect, and most importantly, they cook. There are nights for two sitting at the walnut slab top that is part of the working island. There is a walnut top that is the eating bar and the quartz slab for the working counters. 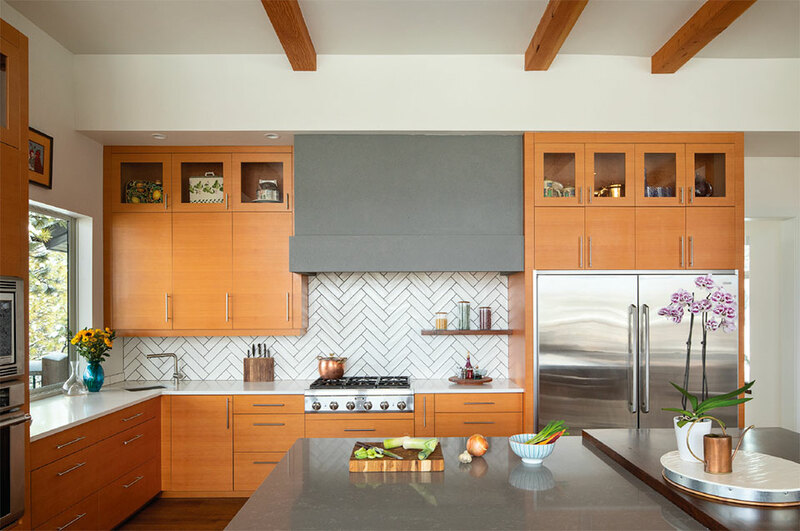 The backsplash is a ceramic tile set in a herringbone pattern. And, there are nights when the wine fridge cannot be kept stocked. The design includes a second fireplace and soothing tones from the floor up with the continued use of the wide-plank oak. Even in the kitchen, the flooring creates a skillful juxtaposition with no loss to the simple natural shades of the rest of the interior. The subtle details of this house honor culture and landscape with humility. A home is meant to be lived in, a place to share love. The understated elegance that makes up this old stone modern never competes with family, play, or the landscape. It’s been built and designed with sophistication and comfort so that everyone can join together at its hearth for years to come.